September 9 will change everything. Pokémon technology will make its next quantum leap. 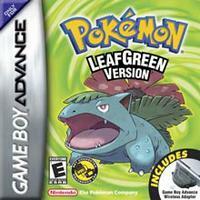 We've seen the future, and it's all about Pokémon Fire Red and Pokémon Leaf Green. The new games are set in Kanto, the region where Pokémon first took root and exploded into a major phenomenon, and the latest titles stuff in tons of exciting new features. One thing's for certain: when Pokémon Fire Red and Leaf Green get into Trainers' hands, Pokémon fans stand to become the coolest, most connected gaming community in the world. Cut the cords! The newest Pokémon adventure lets players battle, trade, collect and more, all without the need for connecting cables. Players simply attach the Game Boy Advance Wireless Adapter, which comes bundled with both versions, to their Game Boy Advance systems and communicate directly with one another. When visiting a special area (the Union Room), connected players appear directly on one another's screens. Pokémon chit-chat! Players who gather in a Union Room can send text messages directly to each other. Up to 40 people can share the environment and up to five people can buddy up at once to join a chat session. Trainers can select pre-set messages to send, or type in messages of their own creation. They can also exchange game challenges, talk battle strategy or just shoot the breeze. More than 100 Pokémon are out there for players to discover. Pokémon FireRed and Pokémon LeafGreen are compatible with Pokémon Ruby, Pokémon Sapphire and Pokémon Colosseum. Pokémon fans can access, trade and battle the Pokémon from their favorite games -- all in one place. Experience expanded gameplay with new adventures, new challenges to face and new territory to explore.